Are you a licensed acupuncturist and herbalist, but don’t want the hassle of your own dispensary? Use ours! The Academy has extensive granular and bulk herb dispensaries and we can fill custom formulas for all licensed acupuncturists. We ship directly to the patients, saving you and your patients money. Unlike other custom pharmacies, Academy for Five Element Acupuncture’s custom formula dispensary does not charge an additional fee to fill outside prescriptions. 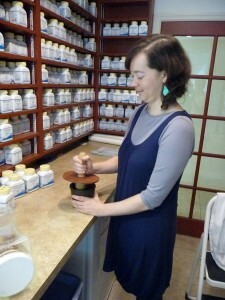 Raw herb formulas are always combined with cleanliness, care and accuracy. Granulated extract formulas are meticulously combined in a separate room specifically designed to maintain clean conditions. All formulas include a printed, GMP-compliant label including all ingredients, dosage, and allergy warnings. Email our simple form for online ordering or order by fax. We are always happy to speak with you personally, too. We are PCI and HIPAA compliant. We offer fast and convenient pick up for local practitioners and their patients. Prompt, flat-rate delivery to practitioners or patients by USPS locally or anywhere in the country. Raw Herb Formulas: $.08 per gram (Exceptions for expensive herbs). No extra charge for grinding. Simply fill out our custom formula form!